Our Condominium is located right on the spectacular Lake Dillon. This spacious 1400 sq ft Condominium provides BREATHTAKING views of the Rocky Mountains and Lake Dillon with nothing to block the view. Enjoy your coffee on our 30 foot deck overlooking it all after a long day of summer fun. Dillon is the center of all Summit County activities including all 4 Summit County Ski Resorts(Keystone-12min, Copper Mtn-20min, Breckenridge-25 min, & Vail Resort-35 min). The Summit Stage Shuttle stop is a block away and provides FREE transportation to and from the ski areas, excluding Vail. Other winter activities include cross-county skiing, snowmobiling, snowshoeing, ice skating, and sledding. This Condominium is completely remodeled with furniture, cherry cabinets, granite countertops, tile. You and your family and friends will feel at home while relaxing on the leather sectional in front of a cozy wood burning fireplace. NEW POSTERPEDIC QUEEN MATTRESSES!! NEW HD TV (not in Pics) NEW 15 PERSON OUTDOOR HOTTUB! This is GREAT FOR FAMILIES who want extra space and/or quiet time for the kids. The leather sectional. There is also a separate dining room with a nice solid wood table that seats 6 comfortably. Sorry No Smoking and No Pets. It has a small-town atmosphere to its location but all the amenities of a resort town without the crowds. The Silverthorne Outlets stores offers great shopping year round and are less that five minutes away. Also, the Grocery Store, Starbucks Coffee, and Movie Theater are within walking distance from our place. Silverthorne also has new recreation center just minutes away for your athletic use. 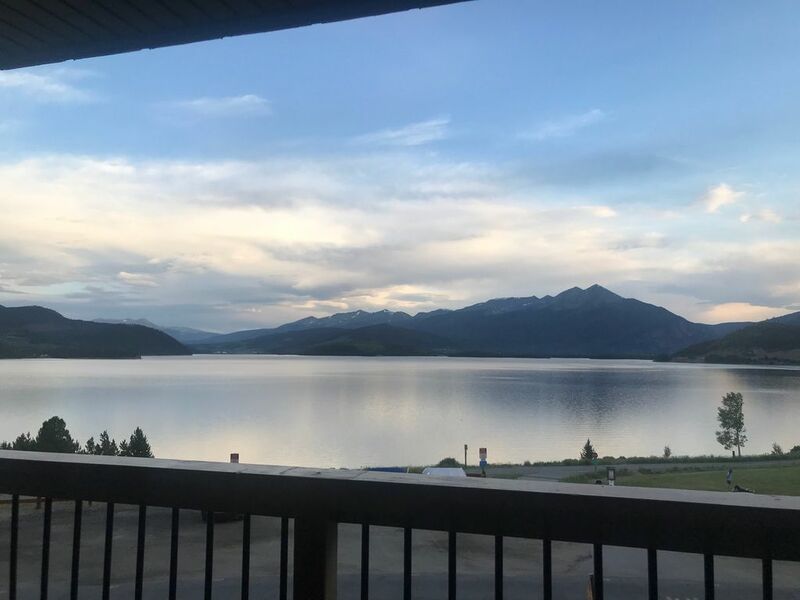 In the summer you can enjoy activities including, walking or biking on the incredible scenic paths that run along Lake Dillon and are steps away from the condo. This path goes to Frisco, Breckenridge and as far as Vail (50Mile Ride). Or enjoy Free concerts at the Lake Dillon Amphitheater, shopping at the farmer's market, fishing, boating, sailing, windsurfing, hiking, whitewater rafting, or just taking your children to the nearby playground/park. The complex also has an outdoor swimming pool, toddler pool and hot tub for your enjoyment. No matter what your interests are, Dillon has something for everyone year round. We invite you to enjoy a vacation at one Colorado's most attractive destinations! We own our condo and use it in the winter and summer. It is a great location and who can beat that view! We take pride in our place and treat it like our second home. We have been very fortunate to have such great renters who take care of our place. new shower doors installed this Spring. Lovely view from this condo. Lovely views of Lake Dillon and mountains. Condo is warm and very comfortable. We enjoyed our snowy week. Excellent views. Great amenities; bbq grill on the deck, community hot tub, fireplace with plenty of firewood, sauna, game room with ping pong and foosball, ski locker, etc. Easy to get to the ski resorts, we skied Vail, Copper and Breckinridge. We look forward to returning. We loved staying at this condo! Everything was just perfect for our 2 families with 2 girls! Very convenient and thoughtful. Thank you! The condo was so clean! You can see the attention to detail. The fireplace was such a great addition. Only unfortunate part was that the only lights are lamps in the bedrooms but it's okay because we only slept there we enjoyed skiing and going out so that's not a big deal. There are no locks on the bedroom doors, and the locks were old so in the bathroom it was kind of tricky to lock the door. The kitchen was fully stocked with dishes and extras, very accommodating. Would book again. What a beautiful condo! It is large, welcoming, bright and very clean. The views are more majestic than the pictures portray. Absolutely breathtaking. And, the location is ideal. Close to the resorts and 30 seconds from town. We will absolutely rent this unit again. CHECK OUT TIMES ARE NOT NEGOTIABLE AS UNIT NEEDS TO BE CLEANED. AN ADDITIONAL FEE WILL BE CHARGED IF LATE CHECKOUT.